Golf is a game of constant striving for improvement. In my almost daily visits to the local Golf Dome, I frequently walk down the hitting line and talk to golfers, primarily older golfers, and with very few exceptions when asked what they are ‘working on’, the answers range from: hitting it longer, hitting it straighter, hitting it more solidly, to getting more spin on the wedges. They all have something in common, they are trying to improve some aspect of their game. What does improvement look like for older golfers? 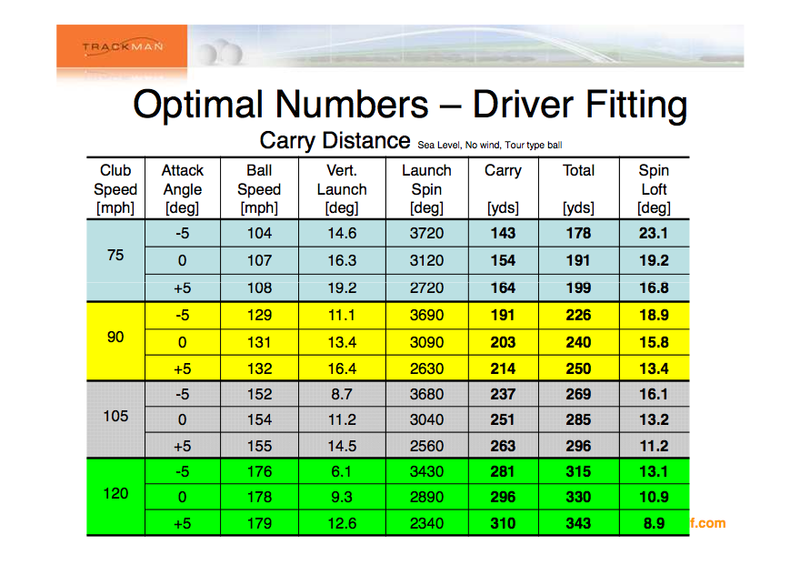 Golfers are preoccupied with how far they hit the ball, especially off the tee with a driver. There is no arguing that distance is an important aspect of the game. In the minds of many (especially younger players) distance is the most important aspect of the game. However, distance alone is not all you need if your goal is to lower your scores or maintain your current scoring level. As golfers get older, distance decreases more so for some than others. The question then becomes, how do you maintain a level of play (your handicap) as you get older and the distance inevitably decreases? Let’s say for the sake of argument you are facing a long par 4, dogleg left. For those of you who have played Bridges visualize the 6th hole. In order to have a reasonable chance of hitting the green in regulation you will need to hit a drive either down the center or favouring the left side of the fairway just past the dogleg. If you hit to the left you will either be in the trees or blocked out by the trees in terms of a clear shot at the green. If you hit it to the right you may have a clear shot at the green but from 230 to 240 yards out. If you hit it down the middle you may still have a 200 yard shot, but it is a clear shot into the green and you have a chance. There are many situations we all face on the golf course where if we hit it straight we give ourselves a chance at par or bogey at worst, even on longer difficult holes. We hear this every week even on the PGA tour, ‘he (or she) missed it in the ‘right spot’. If hitting the green in a particular situation is not realistic for you, make sure that your ‘miss’ is to a position where you set yourself up for a good approach shot. If a green has bunkers on both sides (and you are not a great bunker player) leave your miss short, setting yourself up for a makeable chip and putt for par. If there are severe slopes on one side of the green make sure your approach shot favours the side where there is a flat landing area. Drives and long approach shots require both distance and precision that may be a challenge for older golfers. There is, however, no reason why the older golfer cannot learn to pitch, chip and putt like the pros. It does not require strength and agility, it is something we can all learn. Yet, when we watch amateurs like us practicing and getting ready to play what do we do? We head to the driving range and hit drivers. As our distance decreases with age our biggest return on investment (in terms of practice time) comes from improving our short game. I’ve watched many older golfers and many who are in their early 80’s hit their drives around 200 yards down the middle, hit their approach shot just short of the green, and chip and one or 2 putt for par or bogie. At the end of the day these players frequently shoot their age. The reason, they are never in trouble. In October of 2006 I had an acute ascending aortic dissection while playing the 5th hole at the Wildewood Club. Following 3 surgeries and excellent medical care I recovered and was out on the links on opening day the following year. There was a difference however. I had lost a tremendous amount of swing speed and 40-50 yards off the tee. With practice and exercise I was able to recover around 20 yards of that. My handicap however soared and I realized I would need to learn to play a new game that was shorter and more precise. I concentrated on my short game and within a year or so my handicap returned to its previous level and now more than 10 years later I’ve managed to maintain my handicap at the 2006 level, thanks to an improved short game. I’ve finally got around to working on the blog again and started with the Videos Page by adding 4 videos. They are all on the topic of ‘hitting the little ball first’ and offer good insights into why we tend to hit behind the ball and provide some excellent drills on how to address the issue. So click on the Videos page on the top right of the home page and have a look. In professional sports be it hockey, baseball, football or basket ball reference is often made to the importance of ‘home field advantage’. Professional golf is somewhat different in that it is not a team sport (other than conditions such as the Ryder Cup and the Presidents Cup), it is largely an individual sport and no one player has a distinct home field advantage from week to week. That got me to thinking about the importance of home course advantage in Leagues such as the Central Senior Putter League. I would appear that in this League at least, the home team does have a distinct advantage. Everyone who plays golf is affected to some degree by the official Rules of Golf. Tour players live or die by the rules and will call penalties on themselves to their own detriment. Instead of arguing with officials even when they know the official is right (as is so common in other professional sports), professional golfers police themselves. I’ve played with groups of players at different clubs who play by some pretty lax interpretation of the rules. For example, if you hit a ball into the tall fescue, play it as if you had hit your ball in a hazard. If you land in a divot in the fairway, just nudge it out and give yourself a decent lie. If it’s ‘within the leather’, it’s a gimme. I played with one group where the gimme’s were getting so long that the group organizers put a piece of black electrical tape on each player’s putter to establish what was ‘within the leather’. Some groups essentially play ‘winter rules’ or lift clean and place throughout the season. The justification used is that tour pros who play on perfectly manicured courses would never be put in a postion where they would have to play off the lies that we mere mortals routinely encounter. Then there is ‘Mr. I’ve never encountered a lie that can’t be improved’. I’ve played with golfers who almost on every shot lift the ball to ostensibly ‘identify’ it. Invariably, once replaced, the ball which had formerly been buried deep in the rough is now perched on a nice clump of grass with the back of the ball cleanly exposed. So, for a lot of amateurs, unless you play competitive golf, the rules as they exist are not really that restrictive and the proposed rules changes will not have much effect. A few of the proposed changes however will allow you to do things that under the existing rules even the most wayward golfer could not do without blushing. Here is a link to a complete list of the proposed changes. Here is link to videos that explain the proposed rule changes. Many of the rules changes will be applauded by professional players as the proposed changes tend to reduce ambiguity and eliminate some of the ‘silliness’ from the game. Amateurs, I suspect, will embrace the changes that favour them and continue to ignore or disregard those they see as ‘silly’. The proposed changes will go into effect in 2019. During my years as the Deputy Chief of Police in Winnipeg I conducted extensive research on the statistical analysis of crime with a view to using statistical analysis as a basis for deployment of police resources and reducing crime. The research process involved not only a review of the academic literature on the topic but also meeting with Rudy Giuliani’s consulting group and members of the Manhattan Institute for Policy Research in New York City. Giuliani was the mayor of New York when Compstat was implemented there and the Manhattan Institute was the home of George Kelling who had become well known in policing circles when he proposed the “Broken Windows’ theory in 1982. I also visited Newark New Jersey, one of the many cities in the United States that had implemented programs based on the statistical analysis of crime and met with police officers there. Upon completion of the research I submitted a proposal ( click on ‘proposal’ and scroll down the agenda and click on item 85 for a copy of the report)to the City of Winnipeg and subsequently Crimestat was implemented in Winnipeg. During that same period of time I was a very active golfer and started thinking about applying some of the same principles used to reduce crime towards improving my golf game. In my mind I called it Golfstat. As opposed to tracking where break-ins, car thefts and robberies were taking place and how to reduce them, Golfstat looked at where (on which holes) birdies, pars, bogies and double bogies were being scored with a view to coming up with a means to replicate the good holes and eliminate the bogies and double bogies. The first step in the process was to gather data. 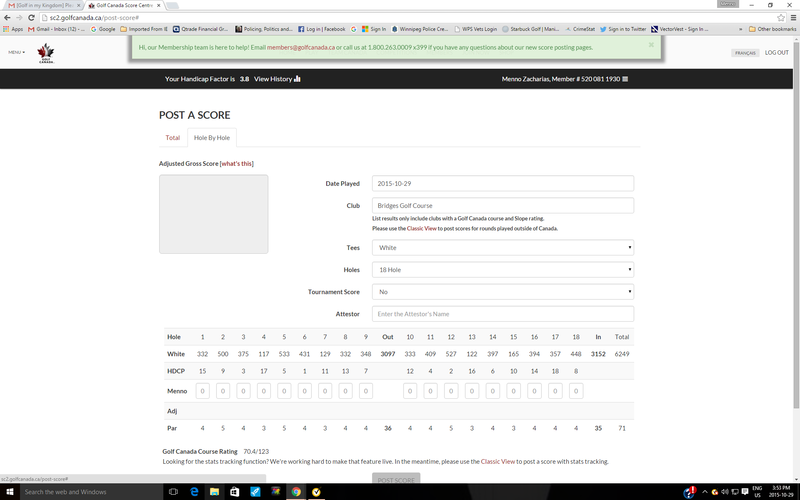 For those interested in this approach an easy first step is to change the way you enter your handicap scores. As opposed to simply entering your gross adjusted score you start by entering your scores on a ‘hole by hole’ basis. The RCGA software allows for not only this but also facilitates the inclusion of other statistical information such as fairways hit, greens in regulation, number of putts and the like and then provides useful information based on the date entered. Once you have entered sufficient data (ten games or so) you can start to do an analysis of the data and draw conclusions and formulate an action plan to improve your scoring. A future post will examine some of the things the data tells you and how to use it to your advantage and improve your scoring.